Please read the instructions carefully before performing the test. Open the bag shortly before performing the test and remove the test device from package. Remove the cap and dip the absorbent head / tip in the urine for at least 10 seconds. OR gather the urine in a clean, dry cup. Place the entire absorbent head / tip in the urine collected for 5 seconds. Errors to avoid: Keep the absorbent head / tip in the urine for less than 10 seconds or place a larger portion of the test device (placing more than the absorbent head / tip) in the urine collected may cause a test defect. Replace the lid on the test device for health reasons and wait for 3 minutes. Read the result after 3 minutes. Do not read the test result after 5 minutes. You can notice a positive result within 1 minute only. Color intensity may vary in apparent test lines because pregnancy stages have different concentrations of pregnancy hormone or HCG or human chorionic gonadotropin. Two lines: Result of the test is "Pregnant"
One line: Result of test "Not pregnant"
No line: Result of test "Invalid"
If the result is "not pregnant" and your menstrual period is delayed, repeat the test after one day. If the test is still negative, consult your doctor. If the result is "pregnant", please consult your doctor to confirm pregnancy (avoid potential risks that harm the fetus, such as x-rays). If the result is " Invalid ", the absorbent head / tip cannot be completely wet. Please repeat the test using a new test tube. If you repeat the test several times, and the results are contradictory, please consult your doctor. 1. How does the Rapid detection pregnancy test work from ACCU-TEST? HCG (hCG) or human chorionic gonadotropin or pregnancy hormone is a hormone produced by the placenta developing shortly after conception and excreted in the urine. This hormone increases until the third month of pregnancy. The rapid detection test of ACCU-TEST can detect this hormone in the urine in a short time. 2. When can the test be performed? 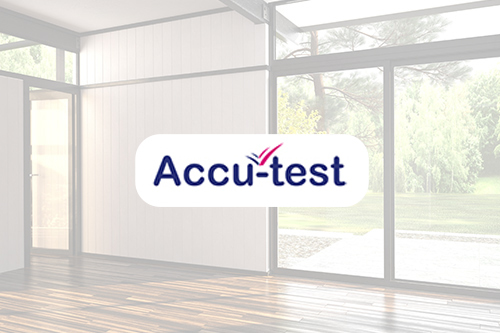 This test from ACCU-TEST has the ability to detect early pregnancy. This test can be used up to 4 days before the expected / due monthly cycle. If you make the test at this time, it is recommended that the test be done in the morning. If you take the test on the expected day of your menstrual cycle, you can take the test at any time of the day. 3. Can alcohol affect / alter the result of the test? No, alcohol usually has no effect on the outcome of the test. 4. Can medicines or treatment affect or alter the outcome of the test? Medicines based on Hormone (hCG), leukocyte stimulating hormone (FSH), LH or thyroid stimulating hormone (TSH) can have an effect on the outcome of the test, while other contraceptives based on hormone such as pills may not affect the outcome. The result of the test should be read within 5 minutes. The negative result, which may change to a positive result after 5 minutes is not considered accurate or correct. Because of the high accuracy of the test, the very low values of pregnancy hormone or HCG or human chorionic gonadotropin are verifiable in the early stages of pregnancy. During this early stage, the number of spontaneous abortions is approximately 31% and 22% of cases remain clinically undiscovered. Along with pregnancy, there are some spontaneous diseases and abortion that may lead to elevated levels of pregnancy hormone or HCG or human chorionic gonadotropin in urine, which can be detected by testing. Urine during menopause or menopause may similarly cause false positive results. Infertility treatments based on pregnancy hormone or HCG (HCG) or human chorionic gonadotropin and drugs may cause false positive results. Please consult your doctor. The low concentration of pregnancy hormone or HCG (or hCG) or human chorionic gonadotropin in very early pregnancy can give a negative result. In this case, the test should be retested after at least 48 hours. Please keep the device and the test out of the reach of children, do not swallow the device or the test or any part thereof. Do not disassemble the test device. Please dispose of the test immediately after use. Do not use the device or the test if the bag is damaged or after the product has expired. one test (1), one instruction leaflet (1). Store at room temperature (4 째 C to 30 째 C) away from direct sunlight, humidity and heat. Sensitivity starts from 10 IU / L.
Accuracy of more than 99%. monoclonal antibodies against pregnancy hormone or HCG (hCG) or human chorionic gonadotropin. Test the tube for use. Do not swallow the product or device. "The world's first 'rapid' pregnancy test giving an accurate result in just 30 minutes"
30 years of world's firsts from the pregnancy and fertility category experts.